On May 7-9 Rome hosted the G7 Youth Summit 2017. The event was organized by the Young Ambassador Society as part of the engagement groups of the Italian G7 Presidency. 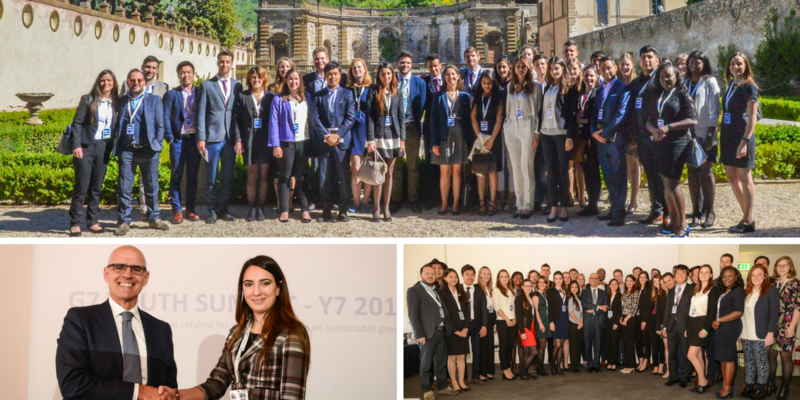 The Summit gathered 32 young Delegates from the G7 countries for three days of discussions on the theme “Rethinking Innovation as catalyst for an inclusive, open and sustainable growth” , in line with one of the three pillars of the Italian G7 Presidency. During the last day, delegates handed over the Final Communique and presented their policy proposals Italian G7 Sherpa Ambassador Raffaele Trombetta, who highlighted the Presidency’s support towards the new generations’ requests. This engagement group had the unique role to serve as bridge between institutions and young generations. It was great opportunity for young people to to express their visions and proposals. During the event delegates discussed on three sub-themes: Production Innovation, Knowledge-Based Capital and Enabling Infrastructures, Future of Work and of Welfare Systems. With regard to “Product Innovation” , the young Delegates stressed the importance of enabling a data economy while ensuring the protection and empowerment of individuals, achieving sustainable growth in accordance with Paris agreement and facilitating dynamic start-up ecosystems and reducing barriers to innovation. With respect to the topic of Knowledge-based capital and enabling infrastructures”, they believe it is important that G7 Governments promote STEM literacy in education, enhance personalized education systems and lifelong adaptability, build public and private partnerships in education and promote vocational and continuous training. Finally, with respect to the “Future of work and of welfare systems” , the G7 Youth demands Governors to tackle inequalities by ensuring that all youth have equal access to employment, to adjust the welfare systems by taking into account the challenges of the transition the digital economy and to think of a reform of taxation systems, recognizing the changing landscape of work and increased strain on social benefit programs as a result of ageing population.